Shown is a photo of the 2015-W Enhanced Uncirculated Native American $1 Coin from the 2015 American $1 Coin and Currency Set. This year’s set with a different dollar design launches on June 16. United States Mint product releases in and around summer tend to be sparse, especially in June, but now there’s at least a clearer picture about what will launch next month. The U.S. Mint in the early AM added two products with release dates to its schedule, the 2016 American $1 Coin and Currency Set for June 16 and the 2016-W Proof American Platinum Eagle for June 30. The pair joins rolls and bags of Harpers Ferry quarters which had already been set to launch on June 6. There are still no release dates for the uncirculated and proof 2016-W American Silver Eagles or for the highly anticipated 2016-W Standing Liberty and Walking Liberty Centennial Gold Coins. This year’s collector Silver Eagles have been delayed because Congress mandated they have flat edges with lettering designating their 30th anniversary. We’ll offer further coverage on the above products as more information becomes available. According to the Mint’s website, the 2016 American $1 Coin & Currency Set will have a “S” Mint mark on the Native American $1 coin. 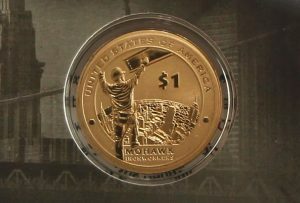 Wonder what the mintage & price will be this year & if the $1 FRN will have a fancy serial number like last year’s set did? re: unreeded edge for the silver eagle. You have to wonder how hard it is to make a planchet with a smooth edge and some lettering rather than a reeded edge. It is a crazy situation for sure. The Mint has been using edge lettering since the late 1700s on some silver & gold coins. And most recently on all Presidential $1 coins & Native American $1 coins. Anything perceived as out of the ordinary seems to befuddle the impotent management at the US Mint!